Jeffrey Eugenides’ The Marriage Plot is a story about self-actualization. Madeleine, Leonard and Mitchell are on the cusp of adulthood and embroiled in a love triangle; self-actualization is definitely a long way off for our three protagonists. The novel documents the proverbial ‘journey’ of the individual and acknowledges the cultural shift that has happened in the Western world since the last century: marriage no longer signifies the expression of a person’s full capacity. Thank goodness. I’m not going to write a proper review today, but I will say this: don’t be put off by the prose in the first chapter; some of it is a bit over the top with superfluous adjectives and adverbs aplenty. It’s a good book; as awkward and pretentious as many of us were in our late teens, but ever-evolving and increasingly complicated in the latter parts. I liked it; I was familiar with its ‘people’, and I always enjoy books that hit close to home. I’m not writing a lengthy post, because I’m feeling a bit depleted by my children. I am a creature of habit, and during the school holidays I tend to feel a bit ‘at sea’. I’ve been feeling this way for the last week; unsettled; a little bit out of sorts. I’ve been writing infrequently and indulging in way too many sugary treats. I’ve been torpid and irate with the kids. My darling poppets grew accustomed to the Lotto life whilst holidaying in Hong Kong and they’ve come home rather tetchy and spoilt. So I’ve had to practise a bit of ‘tough love’ to restore my usually (mostly!) delightful boys. It’s been exhausting. A dear friend of mine, Jen, has provided some relief in the form of a tiny book; a book of consolation. It is about ‘surviving as a sensitive observer in a harsh world’. 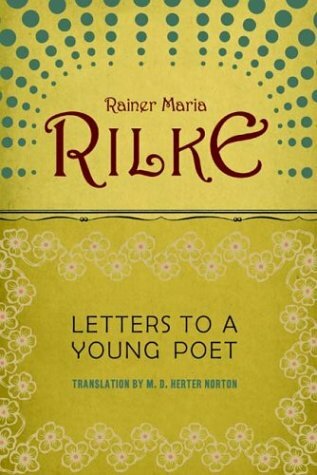 These are letters from German poet, Rainer Maria Rilke, to his young acolyte and would-be writer, Franz Xaver Kappus. Ever humble and unwaveringly kind, Rilke writes of the experiences particular to artists; the inevitable disappointments and heady joys. With nothing can one approach a work of art so little as with critical words: they always come down to more or less happy misunderstandings. Things are not all so comprehensible and expressible as one would mostly have us believe; most events are inexpressible, taking place in a realm which no word has ever entered, and more inexpressible than all else are works of art, mysterious existences, the life of which, while ours passes away, endures. Such is the nature of writing: we writers seek to express the inexpressible; we choose our words with the utmost care, and it can grow to be a tiresome thing, an extremely difficult thing, when the body and soul are weary. I have a feeling that this book will be a good tonic. It will pass, Kristen. It always does. And it’s unavoidable, perhaps even necessary, when it does happen. And I’m at least as unpleasant and tetchy as anyone else when it’s happening to me! How did you get on with your Twilight Zone story? I’m still working on the story. I’m looking forward to seeing you on Sunday. Yep, I lurch about without the routine and direction of school. Kids’ bickering drives me insane — I’m thinking of recording it and marketing it as a torture device for agencies such as ASIO. Time to turn on the Wii, I think! Or get out the elastics or knuckles. So that’s nine minutes of laughter and one minute of bickering in ten minutes of backyard confinement. UN diplomats in the making, perhaps? 🙂 I don’t remember anyone ever telling me that I HAD to play for an hour, as a necessary and not-so enjoyable alternative to something else. The sad thing about computer technology is how damn seductive it is. I was having this conversation with Louise earlier in the week about the dangers of being a Gen-X technophobe parent. But right now I think I’m gonna move to the Simpson Desert when I have a family. Somewhere without wireless coverage, anyway. Or Apple stores. Shouldn’t a temper tantrum caused by turning off the Wii be called a Wii Fit? Sometimes I fantasise about an Amish style existence somewhere in Tasmania. Then I remember who I am. We ‘go bush’ every so often and the return to nature always helps. The boys are far more chilled and happy after getting muddy and building dams in streams. Must add ‘trip to the hills’ to the agenda!